The beleaguered Mariners bullpen came through with four scoreless innings that clinched the series over the Cardinals with a 5-4 triumph Saturday. 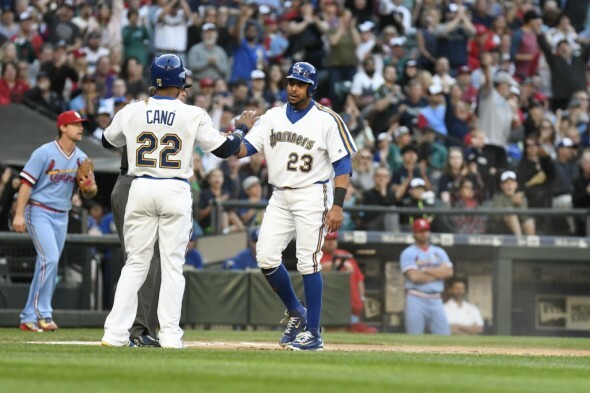 The Mariners jumped out to a 5-0 lead and barely held on, pulling out a 5-4 win to clinch the series from the St. Louis Cardinals, who swept three from the Chicago Cubs prior to arrival in Seattle (box). The bullpen pitched four scoreless innings, with closer Steve Cishek earning his 17th save. On a day when the Cardinals stripped their closer of his job, Cishek looked good. The game was briefly interrupted when a fan watching from The ‘Pen sports bar in center field jumped over the fence and onto the field. The fan ran toward the infield as the Cardinals’ Matt Carpenter sent a fly ball in his direction. For a moment, the ball, the fan and two outfielders looked to converge in dangerous proximity. But the ball sailed beyond the fan and into the glove of LF Seth Smith, who kept his composure as umpires allowed play to continue. A runner advanced to third before security took down the fan near the infield dirt. Starter Nathan Karns had another shaky outing, despite retiring the first eight batters. With two outs and two on in the fifth, he served up a three-run homer to Aledmys Diaz as St. Louis pulled to within 5-4. Karns allowed five hits and two walks over five innings. Strauggling reliever Mike Montgomery came on to open the sixth, but got back on track with 2.1 solid innings. He struck out the only batter he faced in the eighth, then left to a large ovation. Rookie Edwin Diaz finished out the eighth. Diaz got a huge hand when 3B Kyle Seager made a diving stop on the third-base line to take away a probable extra-base hit, resulting in the third out and stranding a runner at first. Cishek overcame a one-out double to throw a scoreless ninth. The Mariners had six hits, all singles, over the first two innings to jump out to a 5-0 lead. All damage came with two outs, as Seattle used a two-run single from 1B Dae-Ho Lee followed by DH Adam Lind’s RBI single to go ahead 3-0. Seattle chased St. Louis starter Mike Leake with nine hits over 3.1 innings. Seattle finished with 10, including three singles from CF Leonys Martin. The MLB season of rookie RHP Adrian Sampson, 24, of Sammamish ended at one game when doctors discovered a torn flexor bundle tendon between the elbow and wrist that requires surgical repair. “I didn’t think it was going to be this bad at all,” he told MLB.com. “Getting the news yesterday felt horrible.” He was hurt in warmups before his scheduled start Thursday in Detroit . . . Thirteen of the Mariners’ past 16 games have been decided by two runs or fewer . . . Saturday was Turn-Back-the-Clock Night, which meant the Mariners and Cardinals were wearing uniforms from 1984. Some of the fans’ outfits being rocked at Safeco Field were nearly as shocking as what may be seen in Sunday’s Pride Parade . . . The Cardinals announced reliever Trevor Rosenthal would no longer serve as closer. Rosenthal blew his third save of the season Friday night when Lind’s three-run homer in the bottom of the ninth left the veteran closer with a season ERA of 5.63. A pair of southpaws are on the mound for the series finale at 1 p.m. Sunday. LHP James Paxton (1-3, 3.34 ERA) is scheduled to start for Seattle, while the Cardinals counter with LHP Jamie Garcia (5-6, 3.83 ERA). Actually, with those throwback uniforms, no one looked good today. True. But let’s take a look at your Eighties wardrobe. I long ago gave up the zebra-stripe stretch pants, sleeveless Iron Maiden t-shirts, and eyeliner.